In four years, Hiscox U.S.A.'s budget for branded content has jumped from nothing to 15 percent of its overall marketing spend, according to head marketer Russ Findlay. Along the way, Hiscox, a U.K.-based insurer that targets small businesses, has created an unusually compelling online dramatic series ("Leap Year") and some video interviews with business leaders. 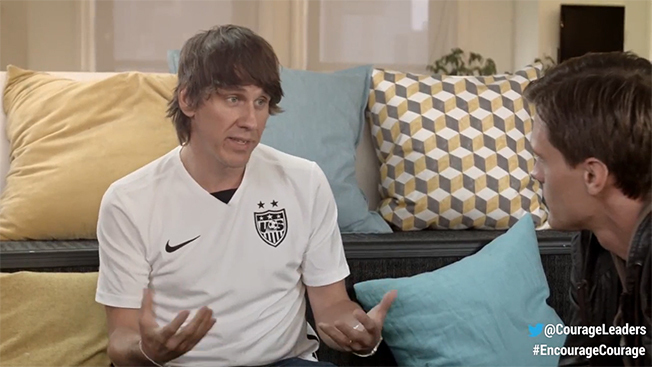 Now, the company is doubling down on video Q&As with a new series that reveals gut-check moments for CEO's like Foursquare's Dennis Crowley and Thrillist's Ben Lerer. Titled "Courageous Leaders," the six-episode series aims to be more realistic than vainglorious by chronicling the hard decisions that entrepreneurs made on the way up, when their success was far from assured. As such, Hiscox hopes to make their stories more relatable. The new content also reinforces the company's larger positioning of "Encourage Courage." "These people really had some trials and tribulations, and they overcame [them] obviously, and they also had to make some tough choices," Findlay said. "Also, there's some common ground on how they just simply approach this whole notion of risk." In the Crowley video, for example, the CEO recounts being laid off from his "awesome dot-com job" and getting evicted from his apartment as he turned 25. Likewise, Lerer shares that a few years ago he got "more obsessed with the short-term focus on monetization and further away from spending the time that I wanted to spend developing the product that was in my head." Beyond Crowley and Lerer, the other featured leaders are interior designer Ross Cassidy, Realtor Adam Mariucci, publicist Jocelyn Johnson, and Bethany Lyons, founder of Lyons Den Power Yoga. Actor Hartley Sawyer interviews the executives inside and outside their offices, with each video lasting between six and eight minutes. Prosek Partners' UNboxd and Iris Mediaworks produced the videos for Hiscox and Vox Media will distribute them on its seven Web sites, including SB Nation, Curbed and The Verge. Hiscox also will distribute the content via its own social media accounts. The video push is part of a larger campaign this year that includes new ads from Doremus, a joint research study on American courage with Forbes and the sponsorship of the Tough Mudder outdoor challenge event. Unlike other insurers, Hiscox does not have a huge media budget—last year it approached $15 million—so the challenge is to do more with less and where possible, lean into branded content. With the new Web series, Findlay believes he'll effectively engage the 25- to 40-year-old entrepreneurs that Hiscox targets. "It doesn't come across as overly produced or overly polished," said Findlay. "The content certainly trumps a fine studio setting—we weren't going for things like Charlie Rose across the desk."